Ten years after Cluetrain’s original publication, too many companies still ignore the idea that markets are really made up of people. In our rapidly changing world, this book’s message is more vital than ever. Companies may be wired for business, but they still struggle with how to talk to their customers like human beings.The 10th Anniversary Edition features extensive new commentaries by industry leaders, but the core message of this modern business classic remains intact. You might not agree with everything these Web provocateurs say…but you will ignore their ideas at your own peril. The pretentious, strident and absolutely brilliant creation of four marketing gurus who have renounced marketing-as-usual. The most important business book since In Search of Excellence. Get a clue. Read the book. 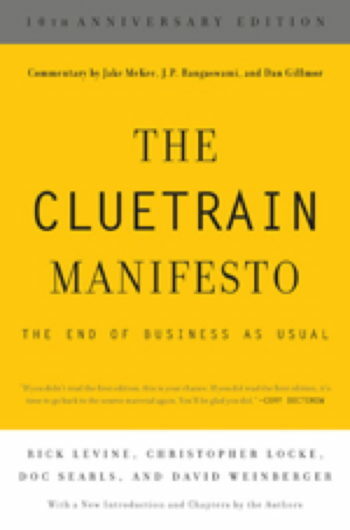 For every retail or consumer-products company wondering why its Internet marketing doesn’t seem to be working, The Cluetrain Manifesto…offers fresh and sound advice, expressed in entertaining prose. Its oft-repeated premise—that markets are conversations—should be pounded into the collective brain of corporate executives.